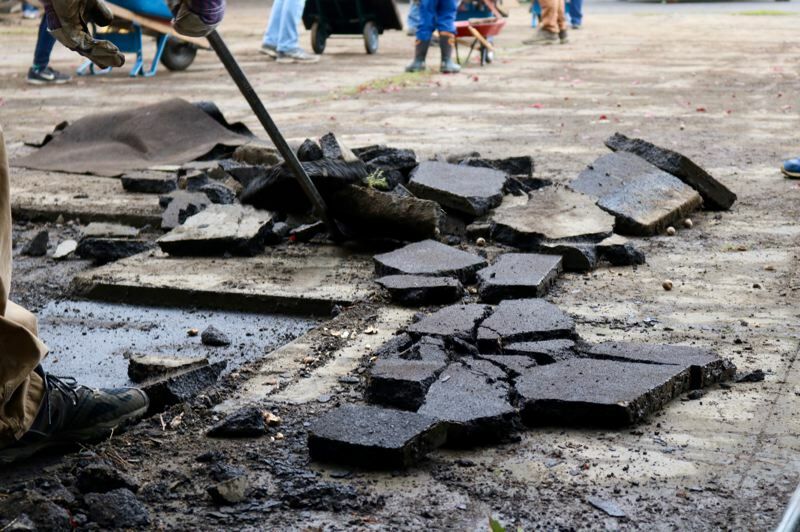 The only majority-black public school in Portland is ripping up 8,800 square feet of asphalt. Call it the antidote to "Big Yellow Taxi." 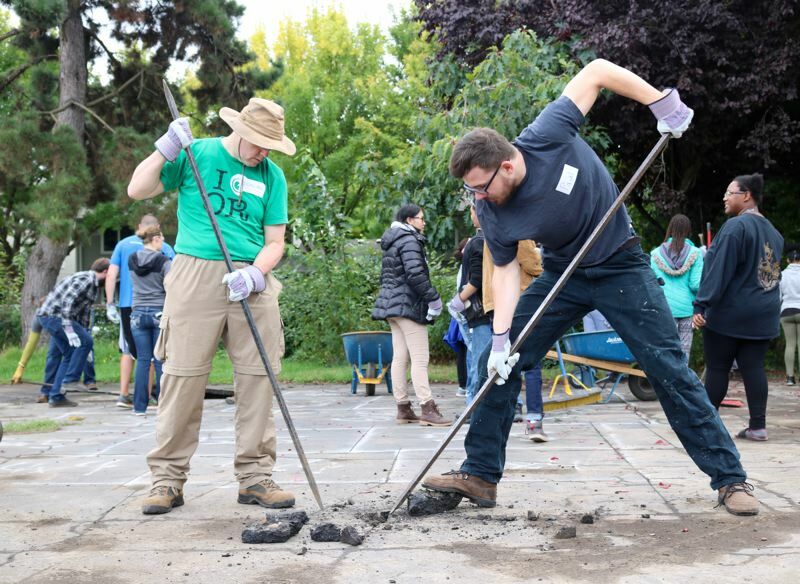 Despite what Joni Mitchell crooned in her memorable 1970 hit, volunteers in Portland are ripping up chunks of a concrete schoolyard — and they're putting up a paradise. "This is what we consider an overpaved space," explained Erica Mattison as more than a hundred volunteers mustered at Boise-Eliot/Humboldt Elementary, 620 N. Fremont St., on Saturday, Sept. 22. "This project will provide better play options, and fewer skinned knees." Mattison is executive director of Depave, the nonprofit in charge of removing roughly 8,800 square feet of asphalt, which will later be replanted with grass, trees and plants. The $25,000 price tag was funded by the Oregon Department of Environmental Quality, the Portland Bureau of Environmental Services and the East Multnomah Soil & Water Conservation District. Replacing the impervious surface with native plants will allow for the natural filtration of rain as it pools into a stormwater inlet. But the biggest winner is the children, who attend the only majority-black public school in the state. Principal Kaveh Pakseresht says kids have been known to weave through the covered basketball court while playing soccer or football. And while there's room to play chase games in grassy areas at the margins of the playground, attendants worry that kids will trip over tree roots or pick up sticks. "It just didn't meet the needs," said Pakseresht, whose approximately 340 pre-K through fifth grade students call him Mr. Kaveh. "That's what's been lacking — space for games that need turf." 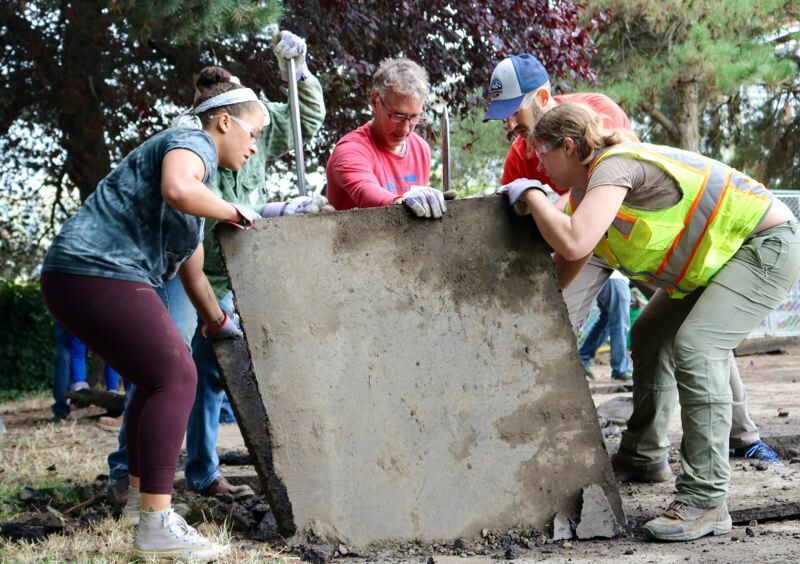 Depave staff and volunteers pre-cut the blacktop with wet saws — "kind of like a tray of brownies," according to Mattison — allowing volunteers to pry up slabs and then wheelbarrow them into dumpsters for recycling. Sadé Beasley was chipping away at the ground as a volunteer for the Blueprint Foundation, which seeks to eliminate the opportunity gap for black youth in the metro area. "Getting that first block is the hardest part," she said. "It's really exhilarating." The project was coordinated by the Lower Columbia Estuary Partnership, who will teach water quality lessons to three classes at Boise-Eliot/Humboldt later this year.